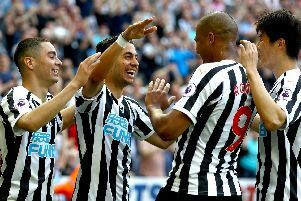 Miguel Almiron has officially been unveiled – and Newcastle United fans have quickly reacted to the deadline day news. The Paraguayan, who has been continuously linked with the Magpies throughout January, joins from Atlanta United on a five-and-a-half-year deal. But it isn’t just any standard arrival for United supporters, who have witnessed the club break their 14-year longstanding transfer record - set by Michael Owen in 2005. The fee is reportedly £16million upfront for Almiron, where adds-on will likely see the deal rise to around £21million. However, while fans are delighted to welcome a new record signing, some believe Almiron’s price-tag is the average fee set in today’s market - further highlighting Mike Ashley’s poor ownership. @Dreamifestation: “I actually don’t think I’ve seen a guy so happy to join us since Alan Shearer”.